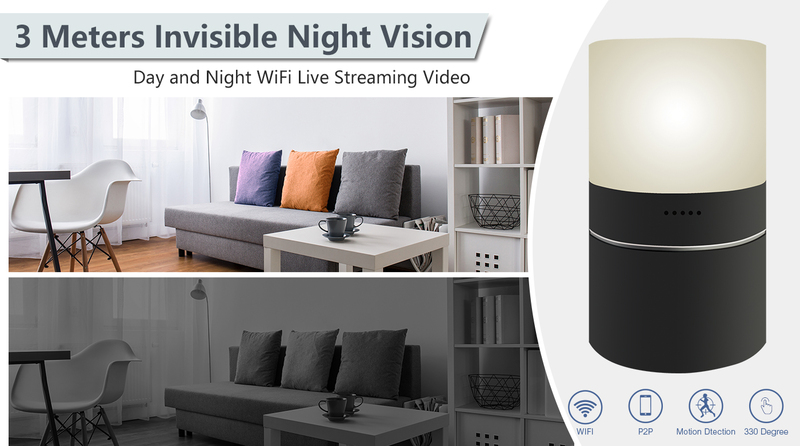 Hiding within the color changing mood lamp is powerful camera with a wide viewing angle of 90°. 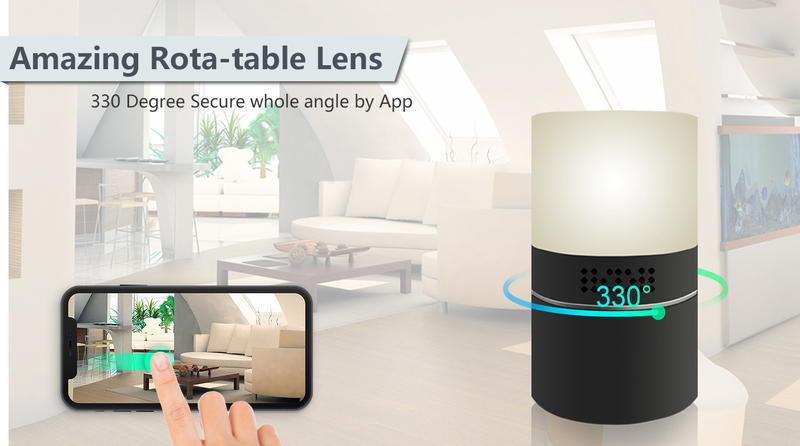 As a bonus, the lens can be rotated remotely with your free phone app up to 330 degrees using your finger. The camera to this unit is hidden behind the screen making the camera invisible. No need to worry about the camera hole being obvious on this device. You’ll be able to see most of your room, edge to edge without missing a thing. All the video is recorded in AVI format using h.264 compression into time/date stamped files for easy saving, emailing or playback on your PC or Mac computer. Even if the camera is handled by someone curious, the electronics are sealed inside. It records 1920x1080 resolution video. 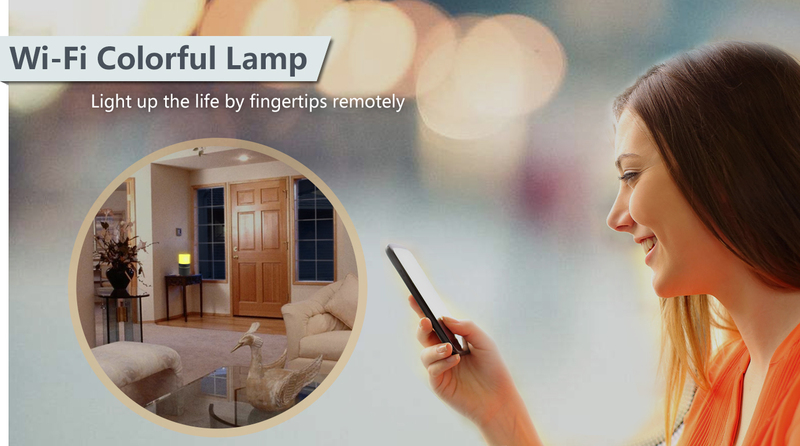 Either record continuously or use the motion detection setting. This model features internal memory. The handy auto-overwrite feature makes it easy to use on a daily basis. No need to worry about battery life since the camera is powered by ac power. Take out of the box, and plug into any wall outlet to instantly start recording motion activated video. As a bonus, there is a 4 hour backup battery, just in case power runs out. Quick. Simple. Easy. This model is lightweight and small, making it perfect for pocket or suitcase travel. It can sit on the hotel nightstand and never raise suspicion. 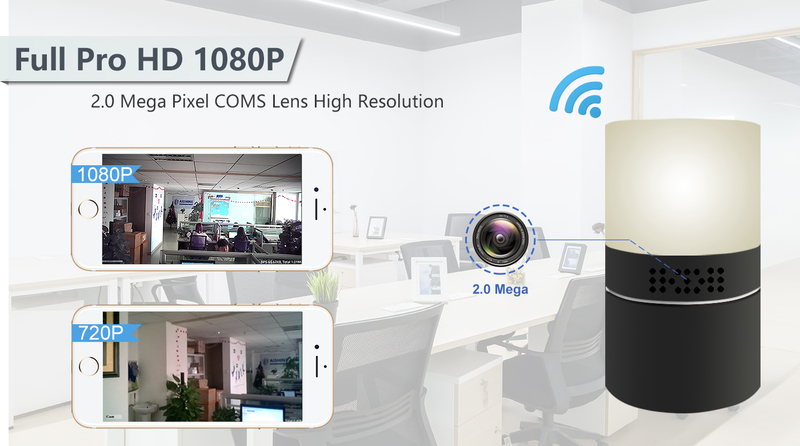 You can record hours of clear video on a 128GB SD card using either the continuous video recording mode or the motion detection mode. This way you don't have to sit through hours of video of an empty room. The camera is even capable of a 90º viewing range so it can follow the movements of anyone who walks through the room. When it comes to storing all this vital footage, it supports MicroSD card storage ranging from 2GB - 128GB. Using an optional 128GB SD card, you’ll get about 120 hours of continuous video, or with motion activation mode only, you'll never run out of video memory. The choice is yours. With adjustable frame rate controls, it’s easy to capture weeks to months of hidden videos. Since normal motion that your TV plays back at is at 30 FPS, recording at a lower FPS (frames per second) will enable you to store much more footage on the SD card. Additionally, you’ll be able to “hot-swap” SD cards by easily removing a filled up one, and replacing it with a fresh blank card. This way you’ll quickly be able to bring the footage back to your computer for review without ever missing important video.